One of the most challenging aspects of treating canine epilepsy is the ability to provide appropriate treatment recommendations to owners to help stop cluster seizure activity at home. The benefit of not having to bring their pet into the ER has tremendous implications. Successful home rescue therapy alleviates a variety of stresses to both owner and pet. Owner anxiety in dealing with their dog’s seizures can be greatly reduced, emotional stress of family member interactions can be calmed, and financial stress of not having to go the ER is eliminated. The latter is often a major deciding factor for many owners in their ability to continue to provide longer term care for their epileptic pets, as going to the ER in the middle of the night is quite disruptive to owner lifestyle, work schedules, and carries a significant financial burden. Decision making factors in choosing home rescue therapy are based on when to implement, which drug and delivery method to prescribe, and ultimately, when to recommend bringing the patient to the ER. Initiation of home rescue therapy is dependent on a number of factors to include seizure type, historical propensity to have cluster seizures, severity of post-ictal signs, and owner anxiety. In general, home rescue therapy is recommended if there have been 2 or more prior cluster generalized seizure episodes (2 or more seizures within 24 hours), prolonged seizure activity of 5 minutes or longer, presence of prolonged post-ictal deficits (e.g. vision deficits, behavior changes) of 10 minutes or longer or historical propensity to have cluster seizures after the first seizure. 4. Complimentary or alternative therapy. The decision-making process should include a candid discussion with the owner on expectations, benefits and risks of each category. Figure 1. 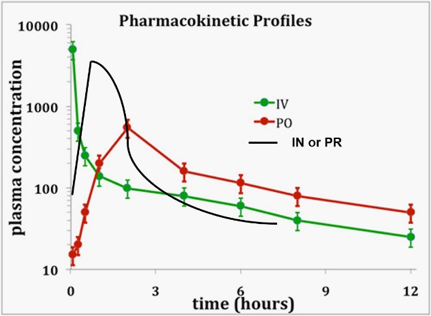 Pharmacokinetic Profile of Rescue AED. Disadvantages include the slow-onset of increased drug-level (15 to 30 minutes), relative minimal increase in AED level (5 to 10 percent), and potential to cause increased drug-clearance and subsequent rebound, transient decreased serum drug-level. No evidence based studies have been published to date. Individual drug recommendation and dosage is listed in Table 1. Table 1. Oral rescue AED selection and dose recommendations for home treatment of cluster seizures in dogs. Pulse dose of a novel oral AED offers the advantages of providing a novel mechanism of action against epileptic seizure activity, ease of use, relatively inexpensive, and minimal adverse effects. Disadvantages include potential drug-drug interaction that could include enzyme induction and lowering or primary AED serum level, sedation, and less likely enhanced risk for hepatotoxicity (depending on drug) as well as potentiate drug-resistance. The latter can occur when oral high dose benzodiazepine therapy is used that could result in resistance to emergent IV therapy if needed. No evidence based studies have been published to date. 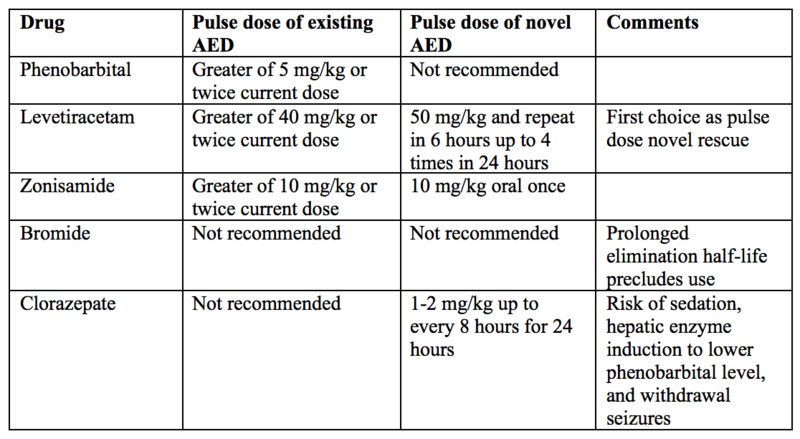 Individual drug recommendation and dosage is listed in Table 1. Non-intravenous (IV) rapid absorption AED offers the advantages of rapid increase in serum and CSF drug concentration in a relative short-time period of 10 minutes or less, evidence-based studies demonstrate proven efficacy to stop cluster seizures with higher potential to avoid ER visits. Disadvantages include short-duration of action (Figure 1), more complicated administration technique, less predictable achievement of therapeutic drug level to brain dependent on administration technique and concurrent drug therapy, and increased cost. 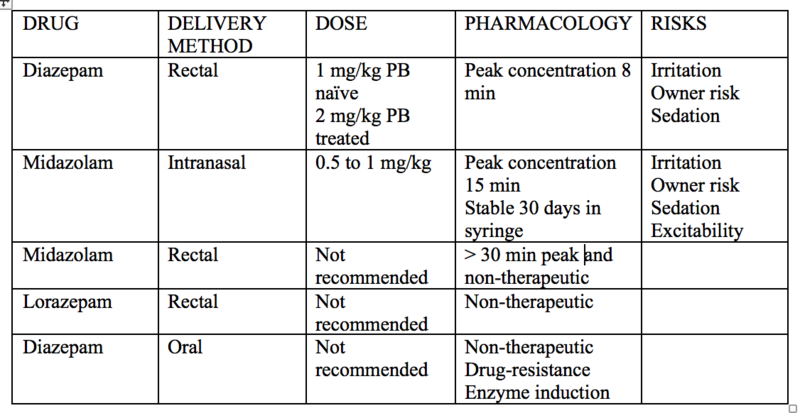 Individual drug recommendation and dosage is listed in Table 2. Table 2. Non-intravenous benzodiazepine treatment for at home cluster seizures in dogs. Complimentary or alternative therapy is becoming more in vogue as owners are looking desperately for non-pharmaceutical options to help their pets. Examples include use of cold therapy (eg ice on head and back, inducing “ice cream headaches), acupressure points, and non-pharmaceutical cannabidiol compounds. None of these therapies have been documented with scientific rigor to be effective. Finally, it is incumbent upon clinicians to provide specific instructions to owners when to seek ER care as follows: if a seizure continues for 10 minutes or longer, a fourth seizure occurs within a 24 hour period, persistent interictal behavior changes, altered arousability or vision changes, and respiratory depression. Overall, careful, individualized selection of appropriate rescue therapy, in-depth client communication on the goals and expectations of this approach, and understanding of the emotional stresses during these trying times, will help clinicians provide a more successful outcome for and connection to their patient and client, respectively.